/ What Is The Best Turntable Under $200? Vinyl is back! With more music artists releasing their latest albums on vinyl records every day, getting a turntable for that ultimate listening experience is once again a thing. However, with so many different models on the market, it’s tough to choose the right one. Chances are that you’re so accustomed to digital devices, that you don’t even know what to look for. Luckily for you, we decided to make a simple yet extensive article about the best budget turntables you can get. From the specs and maintenance to actual models, let’s take a closer look at the best turntables under $200. First of all, you need to have at least a rough idea of how turntables work. 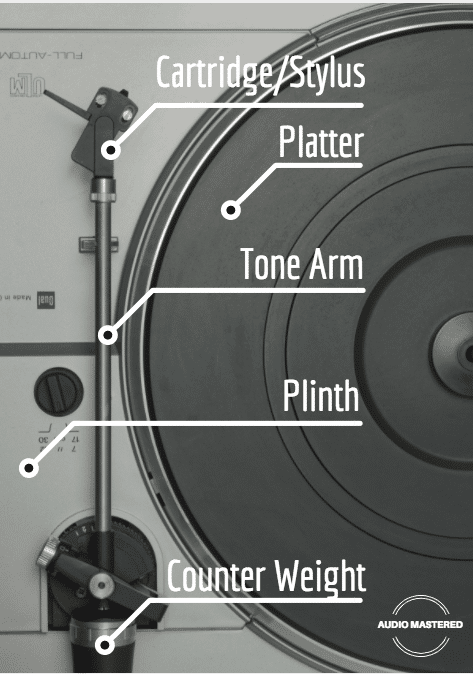 Without getting into too much detail, let’s take a quick overview of the main parts that make a turntable. The tonearm is the part of a turntable that holds the cartridge as it skims across the record. Most tonearms are straight, but models with S-shaped ones are pretty common as well. A good tonearm should be as lightweight as possible, absolutely rigid, and have a bearing with as little friction as possible. However, if you’re looking for a relatively inexpensive turntable, you have to make some compromises. Most budget turntables have a tonearm made of aluminum, which is pretty lightweight but will resonate quite a bit. Carbon fiber and similar composite materials yield the best results, but at this price range, aluminum should do the job just fine. The cartridge is the part that sits on the end of the tonearm and holds the stylus. This part of the turntable is responsible for actually tracking the grooves on the vinyl record and transforming those grooves into a signal for the amp and speakers to recognize as sound. When looking at non-audiophile turntables, most cartridges are MM or Moving magnet ones, so look for this type if you don’t want to spend too much money. Make sure that the model you end up getting comes with a cartridge, or you will have to get a separate one. The platter is the round, rotating surface on which a record sits. It should be as dense as possible in order to provide you with as little rumble, distortion, and other unwanted noises. Once again, budget turntables have to cut corners in every possible way, and platters are no exception. Although not that dense, aluminum has once again proven to be a good, inexpensive solution. So, in order for a turntable to produce sound, the platter alongside with the record needs to rotate. There are 2 different types of drive, belt-drive and direct-drive. Belt Drive: basically means that there is an elastic belt that’s connecting the motor and platter. The elastic belt manages to cancel out a portion of the vibration coming from the motor and ensures a much more consistent and cleaner sound. Direct drive: direct drive on the other hand, means that the platter and record get up to speed much faster, which may not be that important for casual listening sessions, but DJs find this feature to be very important. With both drive types having pros as well as cons, it’s up to you to see which one you find to be more appropriate for your actual needs. As the signal that the turntable is sending is generally too weak for you to simply use a pair of speakers, we need to explain a thing or two about phono preamps. Some turntables have an integrated phono preamp which means you can plug them into just about any receiver. There are receivers and stereo systems that have a dedicated Phono Input which allows you to simply connect a turntable to it. However, if neither of these is true in your actual case, you need to buy a separate, external phono preamp. This feature can especially be handy for people with a large vinyl record collection. Some models offer the ability to import records to your PC via a USB connection. If, however, you don’t plan on saving all of your albums from vinyl on your PC, a standard stereo audio connection is definitely good enough. Some models allow you to change certain parts, such as the belt (if it’s a belt-drive), tonearm, cartridge, and other. This means that after some time, you are able to upgrade your turntable to cater to some potential new needs. Having this in mind is important if you feel like you’re going to want to invest time and money in this new hobby! Dust: Dust is probably the biggest enemy of turntables. Make sure that you use the cover that comes with the turntable at all times. Regular cleaning with a soft brush should make it work at its full potential and last you a long time. Never Touch The Stylus: The stylus is very fragile and can easily be broken off. It's best to avoid touching it as much as possible. Pay Attention to Your Records: If your turntable isn’t fully automated, you will have to move the tonearm yourself. If it is automated, there should be a lever for raising/lowering the tonearm. Always use it! Don’t lower the tonearm by yourself, as you can exert more pressure on the record than you’re supposed to. This can result in a damaged record, or even worse, a broken stylus. The tonearm uses a very fine bearing, which, if the tonearm is moved too vigorously, can be damaged as well. Don’t Put the Turntable On Speakers: the vibrations from the speakers can affect the reproduction quality, as well as cause damage on the turntable over longer periods of time.Listening to vinyl records is really a unique experience. Try to treat your turntable with as much respect possible, and it will provide you with many hours of truly special, hi-fi tunes and beats! 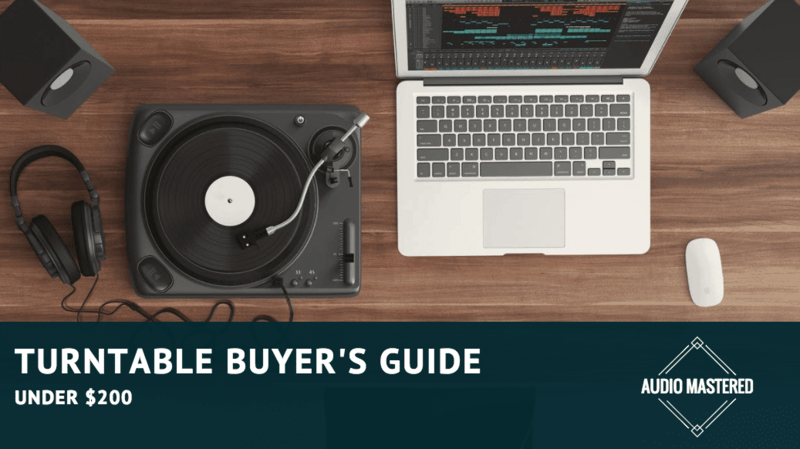 If you are looking for budget turn tables, but sure to check out my guide on record players under the $100 price point. Additionally, you can find my guide on retro record players that replicate the portable record players from the 70s. Starting out with the least expensive model, at number 1, we have the PLTTB1 by Pyle. Offering all the important features, and most importantly a pretty good performance, for just around $75. This model is probably your best option if you’re an absolute beginner. While it definitely has some flaws, the sheer affordability and overall good build quality make it worth the money. It features a belt-type drive, making sure that any unwanted vibrations are easily eliminated. The weighted “S” tone arm feels pretty solid and offers adjustable weights on the back. Buy an external pre-amp if your receiver needs one. The +/- 16% pitch control really comes in handy if you plan on listening to vintage records, as they commonly require a slight pitch correction for the best possible sound. Unfortunately, the PLTTB1 doesn’t have a built-in pre-amp, so make sure that you have a receiver you can use it with, or simply get an external pre-amp. Bottom Line: All things considered, the PLTTB1 by Pyle is a great entry-level turntable that will give you a warm introduction to the world of vinyl! Audio Technica is known as one of the best audio equipment brands on the market. Their AT-LP60 turntable makes listening to vinyl records an easy and fun experience. As it is pretty portable and lightweight, the AT-LP60 can easily be moved around. Absolute beginners will find this model as very convenient, due to its fully automatic operation. You won’t have to worry about damaging the stylus, or the tonearm, as you only have to press one button and voila! Perfect beginner turntable. The most popular turntable on the market today. You can choose from 2 speed presets, 33 1/3 and 45 RPM, which should cover the majority of records you might want to listen to. The platter is made of aluminum but offers surprisingly high levels of anti-resonance. You won’t have to worry about compatibility with the rest of your setup, as the AT-LP60 has a built-in pre-amp, which you can also switch out if you find one that’s more appropriate and offers a better experience. Bottom Line: Offering a slightly different approach than the previously mentioned model, the AT-LP60 from Audio Technica is a beginner turntable you can use right out of the box. Sony is a company that really doesn’t need an introduction. Their PSLX300USB not only looks and sounds good but offers the ability to immortalize your special vinyl collection in no time. Starting from the specs, we can see that this model meets pretty much all the demands. The speed is adjustable from 33 1/3 to 45 RPM, and the whole operation is fully automatic. The belt-drive mechanism ensures optimal listening experience, but it also means that this turntable may not be ideal for DJ-ing or similar purposes. Good for beginners. More advanced users will want more. The static balance tonearm is automated as well, so you can’t really set it up yourself. While this is a convenient feature for beginners, more advanced users usually prefer the ability to manually set the balance. A pre-amp is, of course, included, meaning you can use this model with pretty much any audio setup you might already have. What’s really great about the PSLX300USB is the USB connectivity option. Saving a digital copy of your vinyl collection is super easy, and by using the included software is done in no time. Coming from a brand that’s not that popular amongst audio enthusiasts, the Victrola 50’s Retro Bluetooth Turntable definitely offers a pretty unique and interesting approach to turntables. Innovative Technology focused mainly on versatility and looks, but how does this model perform? Looking at the features, it’s clear that this turntable is much more than that. Besides regular old vinyl records, it has an AM/FM radio, plays CDs, and can be used as a Bluetooth speaker. Buy if you're looking for the retro look. You'll want something a little better if you're looking for sound quality. Vinyl-wise, you will be able to play just about any record you might have, as the Victrola supports 33 1/3, 45, and 78 RPM records easily. What’s really great about this turntable is that it doesn’t need any external device to operate. It has stereo speakers built-in, so you basically plug it into a wall outlet and listen away! As you’d probably expect, you can’t upgrade any part of it, except, of course, the stylus, which is replaceable. Bottom Line: ​While the Victrola may not be as good as some of the other turntables we’ve mentioned, it pretty much compensates with the rest of its features. It’s a multi-purpose device which gives you the ability to enjoy music no matter the format. Coming up at number 5, we have yet another turntable model that’s pretty self-contained. The LP by Musitrend doesn’t support CDs or Bluetooth streaming but offers excellent quality in terms of vinyl reproduction. The first thing you’ll probably notice is the minimalistic and sleek design. The see-through cover not only protects the device but still allows you to watch the record spin while you’re listening to your favorite tunes. Once again, you’ll be able to play pretty much any record, with all 3 speeds being featured with the LP. Main attraction here is the simplicity. If you don’t want to use a turntable with additional speakers, or simply can’t afford them, fret not as this model has a pair of 3W ones built-in, and they actually sound pretty good. Almost the whole operation is automated, with only an on/off switch, volume controls, speed knob and a small lever for raising/lowering the tonearm. The LP can record your favorite vinyl albums on your PC via the USB cable and can be hooked up to external speakers via the RCA connectors. Bottom Line: ​​The LP by Musitrend is a simple yet effective turntable focused on beginners. It’s definitely worth considering! 1byone may not be as popular as Audio-Technica or other audio equipment brands, but they sure know how to make a decent turntable! Their models are very well received by users and have very good reviews and ratings. Let’s see exactly what makes this turntable so special and liked. Starting with the design, this model looks pretty sleek. Though it appears it’s made out of wood, it’s actually just a finish. Nonetheless, it will make a good-looking addition to your audio setup. Offering more than just vinyl record reproduction, this turntable features Bluetooth audio streaming, as well as your regular aux and USB input. A great middle-ground for this price point. No complaints here. As the whole operation is automated, you can simply place a record on the platter, press a button, and you’re good to go. However, this means that you can’t really adjust anything. For example, some skipping may occur, due to the balance of the tonearm. This can easily be fixed by adding additional weight, like a small coin, but it should’ve been more convenient than this. The audio is pretty good, and definitely at a higher level than most other turntables at this price range. Bottom Line: ​​​The 1byone belt drive Bluetooth turntable offers a great vinyl listening experience as well as additional connectivity features, making it a great option worth considering. At number 7, we have a model coming from the well-known and loved folks at Pioneer. The PL-990 is a relatively inexpensive and great sounding turntable that packs quite a punch as well as some very useful features. The attention to detail that went into making this model is at a very pleasing level. Both 33 1/3 and 45 RPM records are supported, and the low-vibration belt-driven motor ensures that no unwanted vibrations or noises are present. Perfect for those looking for quality over looks. The tonearm is of much higher quality than the ones we’ve gone over so far. Changing the cartridge is very easy, and as the connector is universal, you can fit pretty much any model you might want. The operation is fully automated and smooth, ensuring both optimal playback as well as longevity of both the records and the stylus. Pioneer included a built-in equalizer, meaning that the signal gets a nice boost in strength and quality before reaching your amp. Bottom Line: ​Getting the PL-990 ensures you’re getting a high-quality listening experience, with room for improvement and upgrading at any time. When it comes to beginner and budget turntables, you can’t always expect much. However, the C100A-SI by Crosley shows that you can definitely find a turntable that meets most people’s expectations. What makes this model so special is the ability to adjust the sound, speed, and other important variables while still being pretty simple to use. The strobe light helps with adjusting the pitch, and the tonearm balance is easily set via the counterweight. A decent option with a little more fine-tuning for those who need it. Anti-skate helps with providing a consistently optimal playback, and you operate the whole device with a simple, large button on the bottom left corner. While the sound is above average, it still lacks some presence and low end. The fact that the body is made of ABS means that there will be more vibrations that may affect the sound and performance. Bottom Line: ​​​​All things considered, pairing this puppy up with a good amp, and doing all of the adjustments correctly will make for a very pleasant vinyl listening experience. The AT-LP60BK-BT is Audio Technica’s take on Bluetooth turntables. The combination of their high-quality craftsmanship and upgraded connectivity makes for a very convenient model. This turntable connects the fine sound of vinyl records and the convenience of Bluetooth speakers. Unlike other Bluetooth-enabled turntables we’ve gone over so far, this model doesn’t allow you to stream music via the turntable but instead streams the audio from the vinyls to your wireless speakers, headphones or receiver. A perfect option for those who own Bluetooth headphones or speakers. The controls offer both 33 1/3 and 45 RPM playback, as well as fully-automated operation, including the raising/lowering of the tonearm. Besides the wireless connection, you can use the AT-LP60BK-BT with either a phono-enabled receiver or a one that doesn’t support it, as the built-in preamp can be toggled on/off. The performance and overall impression are the same as with the no-Bluetooth model, as all of the parts are basically the same. 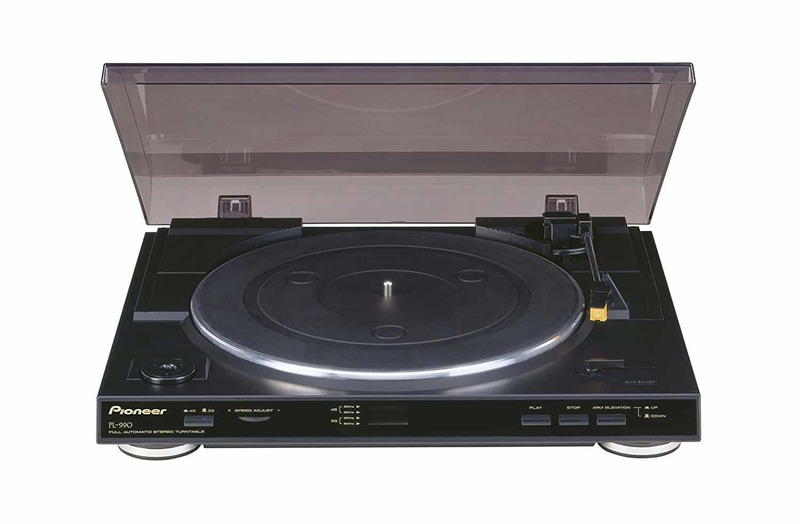 Bottom Line: ​​​​So, if you’re looking for a decent automatic turntable which you can use with your Bluetooth- enabled headphones or speakers, the AT-LP50BK-BT is a great option. And finally, at number 10, we have the AT-LP3 by Audio Technica. As far as turntables for under $200 go, this is probably the best it can get. The high-quality build and attention to detail are obvious at first glance. This turntable not only looks premium, but feels that way as well, and will last you a long time. Once again, this model is fully-automatic as well. However, unlike most models, the AT-LP3 didn’t stop there. This is what I would personally buy. This turntable dominates over every model at this price range. You can enjoy the simplicity as well as the ability to set everything up just like it’s supposed to be. Anti-skate feature is present, the tonearm is fully adjustable, and the cartridge is easily swappable. Both 33 1/3 and 45 RPM records are supported, and the sound is simply amazing. Sure, the more expensive models may sound better, but in this particular price range, the audio is noticeably above the competitors. Bottom Line: ​​​​​All things considered, if you’re looking for the best turntable for under $200, look no further than the AT-LP3. The superior build and audio quality alongside room for upgrading each individual part make it the best model in this class. That pretty much wraps our article! I sincerely hope that you found it informative and that it helped you in finding just the right turntable for your needs.